Do you need a quick snack to satisfy kids AND adults? These Easy Ranch Pretzels are super-fast and super-tasty. You won’t have any leftovers! We are big fans of these Garlic-Parmesan Pretzels. I found that recipe in Mom Knows Best by Gooseberry Patch. 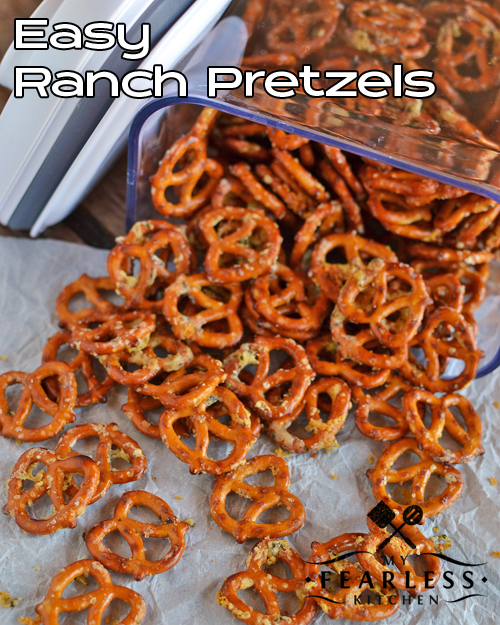 We loved the Garlic-Parmesan version of the pretzels so much, I knew I was going to have to try some different flavors! Want to try the original? (Yeah, you do!) Grab the recipe over here. “Mom Knows Best” is full of fast and easy recipes. We have loved everything I’ve cooked from it so far! 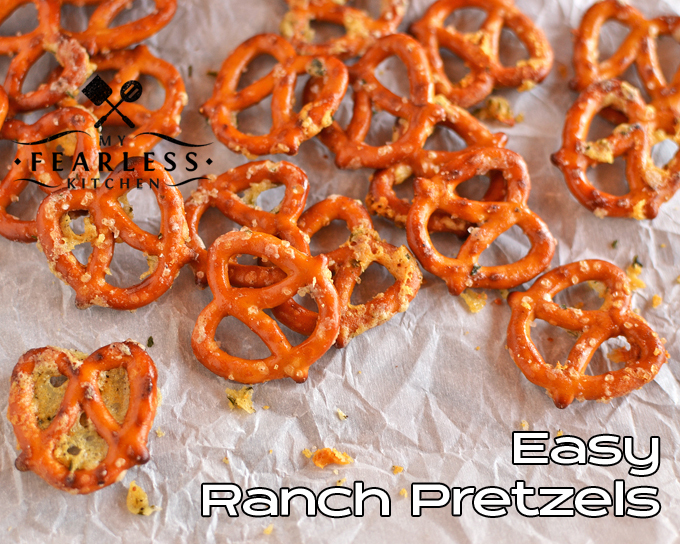 There are three ingredients in these Easy Ranch Pretzels – pretzels, butter, and ranch dressing mix. It takes 5 minutes. Even the hungriest kids can wait 5 minutes for an after-school snack! (…right?) It’s so easy to do, they can even help make it. You only need two tips for this recipe. Make sure you are using a large enough microwave-safe bowl for your pretzels (otherwise you’ll make a mess trying to toss the pretzels in the butter mixture). Use a soft rubber spatula to mix the pretzels (otherwise the pretzels will break). Do you need a quick snack to satisfy kids AND adults? These Easy Ranch Pretzels are super-fast and super-tasty. You won't have any leftovers! Pur pretzels in a large microwave-safe bowl. Place butter in a smaller microwave-safe bowl or glass measuring cup. Microwave butter on high for 1-2 minutes, until melted (watch closely). Add ranch dressing mix to melted butter, and stir to combine. Drizzle butter mixture over pretzels, toss lightly to mix. Microwave pretzels on high for 1-1/2 minutes. Remove from microwave, stir. Microwave pretzels on high for 1 more minute. Remove pretzels from microwave and stir. « Can I Eat Raw Cookie Dough? I know I can get Samuel to wait 5 minutes….at least for these fab pretzels!! I love that they are so quick to make! These look so good and love how easy they are to make! I have never tried these. Sharing on my FB page today! Happy Weekend! The ranch dressing mix turned into a globbed mess when mixed with the melted butter. Stuck in big clumps to about 3 pretzels. Couldn’t get it to spread around. Have the recipe the benefit of the doubt and thought maybe it would spread around after microwaving the pretzels. Nope. Turned into crusty globs stuck to 3 pretzels. Wish I would have just poured melted butter on the pretzels and sprinkled with the dressing mix.